As you know, I love natural products, especially deodorant. Trying to find a great natural deodorant that you trust is a nearly impossible task. Not only can you end up spending a lot of money trying to find the perfect one, but failing to find a natural deodorant that actually works can result in embarrassment from coworkers, friends, and even family. I’ve spent some time trying different natural deodorants in order to find some that actually worked. I focused on natural deodorants because I don’t want any aluminum, parabens or other toxins in my deodorant. Native Deodorant doesn’t contain any aluminum, parabens, phthalates or even talc. It’s great at preventing odors, even when you’re working out! It also kept me dry all day, and didn’t have that sticky or greasy feeling that some natural deodorants give you when you apply them. For the week, I kept the deodorant in my purse in case I needed to reapply before heading off to the gym, but after a while, I completely trusted it, and left it on my bathroom countertop when I left home! I also really liked that it came in stick form, and not in a jar. Native has earned thousands of great reviews. It comes in five different scents: Unscented, Eucalyptus & Mint, Lavender & Rose, Coconut & Vanilla, and Citrus & Herbal Musk. My favorite is Coconut & Vanilla. CHECK OUT NATIVE DEODORANT HERE. 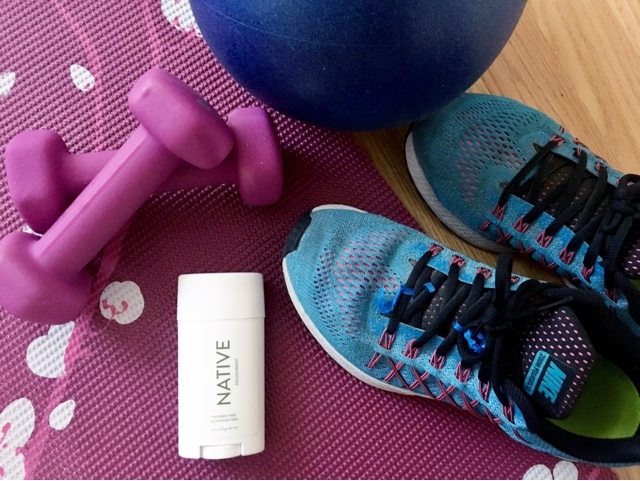 The folks at Native Deodorant are offering readers 10% off any purchase over $15. Use coupon code MOLLIE10 to apply the discount! Lavanila Deodorant earned the number two spot on my list. Like Native, it’s made without aluminum or parabens, which is really important to me. It comes in some really fun scents too, but I thought Native lasted longer and it was a bit less expensive. You can’t talk about natural deodorant without mentioning Tom’s. Tom’s makes a deodorant with aluminum and a deodorant without aluminum, so you do have to be careful when buying it to make sure you get the natural version. Tom’s has been making healthy products for 30 years! The natural version of Tom’s Deodorant is really easy to apply - it goes on like a traditional antiperspirant - but in my opinion, it definitely wasn’t effective as Native or Lavanila. Buy It Here *Thank you to Native for sponsoring this post! Thank you for this!! I'm always looking for reliable natural deodorants, none ever seem up to the task. Can't wait to try Native out...many thanks girl! !